I’m going to focus on design this month. 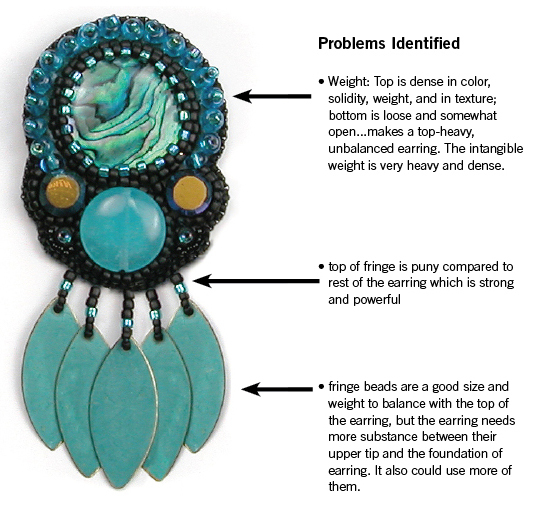 I want to explore what I call “intangible weight,” which is so important in jewelry design. This concept plays a critical role in the balance and proportion of your designs. I refer to this weight as “intangible” because you can’t measure it. Intangible weight does include what you can measure. And it also includes what you see, feel, and most important, what you sense. Rev up your intuition for this, folks! I was pleased with the earring to the right. I liked the width-to-height ratio. The colors were perfect. The pair looked lovely on my work table, so I finished them. When I tried them on, they didn’t work. They looked clunky. Since most women don’t do “clunky,” and I intended to sell these, they needed to be a bit more elegant. “Longer” was the first solution that came to mind. But not just longer…I knew the fringe needed to be both longer and more substantial to balance the bulk of the earring itself. But whoa… these were already large, dramatic statements. Dare I make them longer? After measuring, comparing proportions, and trying various fringe variations, here is the final pair (on the left). They look beautiful hanging from ears. They were purchased before the show began, by a black-haired beauty with dark eyes, whose fashion style flows effortlessly from dramatic to elegant, and always makes a bold statement. Let’s examine the width-to-height ratio to see what we can learn. Note: In my measurement of total width I’ve not included the width of the fringe because when the earrings hang, the fringe width will narrow to match the width of the top. 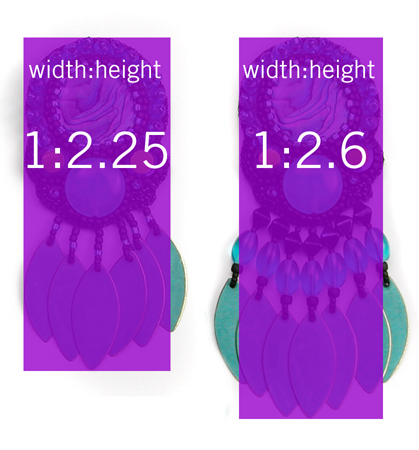 The initial earring width-to-height ratio is 1:2.25. In looking at the purple rectangle, I find that ratio very pleasing and elegant. It’s very close to 1:2, which is a standard, commonly agreed upon as harmonious ratio. But given the intangible weight of the top of the earring, which includes the visual density, weight, texture, color, and substance, the earring needs to be somewhat longer to be just right. 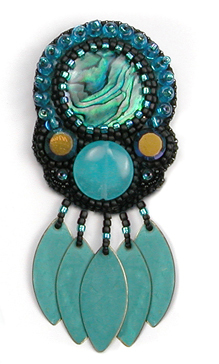 In addition to making the fringe longer and wider, I made it more substantial by adding more beads to thicken each strand. If I’d not taken into account the intangible weight and made the earring longer – not more substantial – the outcome would have been unbalanced. The fringe required more substance to balance the intangible weight of the top. 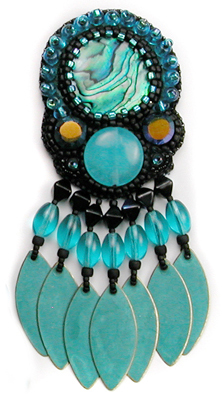 Interestingly, the first earring I made, the one that looked so clunky when worn, does not look as clunky when presented by itself. Even now as I look at it on the page I really like it. But believe me, it looked bad when worn. The imbalance was so much more obvious when in context, i.e. : on a person. Take into account the intangible weight: how heavy (or light) you sense the piece (or part of the piece) is. Color accounts for part of this intangible weight. So does texture. Using those elements and principles you got to ensure your work is balanced and attractive to the eye and the ear. « 2011 COLOR TIP 2: Inject a whisper of the complement.